Beautiful and creative, but controls and design issues often drag it from challenging to frustrating. 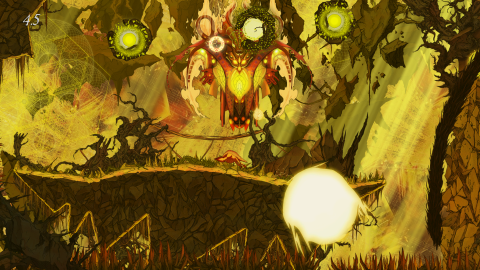 Aaru's Awakening is a 2D action puzzle-platformer made by Lumenox Games. It features beautiful, hand-drawn environments and animation, and a wonderful, soothing soundtrack. So why did I hold up two middle fingers at it for several long, angry seconds? We'll get to that in a minute. I'll spare you the lore: let's just say Aaru is a yellow monster you guide through four gorgeous yet dangerous realms filled with spiked walls, falling platforms, toxic pits, enemy monsters, and tons of other traps and hazards, including several boss fights that often contain many of these deadly elements at the same time. Besides running and jumping, Aaru can perform a charge, a flying headbutt useful for bashing through crumbling stone walls and getting a few extra feet out of a jump that's fallen short. Aaru can also teleport by firing an orb and appearing at any point in the orb's trajectory. Sometimes you bank the orb off walls or floors, or through narrow vents in the rocks, or to bypass hazards that would otherwise harm or kill you, like a game of teleportation billiards. It's also Aaru's only offensive weapon. Fire an orb at an enemy, and as it passes through him, blink yourself to it. Telefragged, sucker. It's nice that Aaru has an actual weapon, because he's quite frail otherwise. Most traps will immediately end your life, though some hazards, like scorching sunbeams, take a second or two to kill you. When you die, you're shown a death screen displaying a skull and are transported to your last checkpoint to try again. We're getting close to the middle fingers, now. Visually, Aaru's Awakening is a real treat. The hand-drawn environments and animations are strange and beautiful, and even the level selection screen is something you just want to stare at for a while. Looking at the game is like flipping through the pages of an weird indie comic book or watching an experimental animated film. Bosses look bizarre and amazing and basically represent their own multi-stage levels, even containing their own internal checkpoints. The problem is, there are problems. The controls are easily the weakest aspect of the game. Teleporting works well, but charging can be problematic. Aaru runs back and forth with the A and D keys, but charges toward the position of your cursor instead of in the direction he's moving, which feels counterintuitive. While trying to scootch him carefully to the edge of a ledge he may instead lurch forward a full step and plummet off. Even after hours of play I never felt like I was in perfect control of Aaru. The artwork, while wonderfully creative and unusual, often doesn't do a good job differentiating traps and not-traps, nor makes it obvious what is part of the background and what presents a physical obstacle. The death screen pops up so immediately after you perish that you're often prevented from getting a good look at whatever it was that killed you. When these problems all appear at the same time, things spill over into out-and-out frustration. Sometimes you have to fire an orb offscreen and teleport to it, and when you blink in, you're immediately killed by a hazard you can't really see. The sudden death screen doesn't allow you to plan your next move. Trying to charge or jump your way out of the situation often doesn't work well because of the control problems. And, sometimes the checkpoints require you to replay several earlier traps just to return to that one frustrating spot, where you get the briefest of glimpses at the situation before having to try again. A dozen or so consecutive failures like this, and that's when the twin middle fingers come out, and come out hard. I don't want to pick on Aaru's Awakening for requiring split-second timing, trial-and-error learning, or memorization of levels: that's all been a staple of platformers from the beginning. The game is clearly meant to be a brutal challenge, and it really is, often quite satisfyingly so. It's when all the issues mentioned above show up at the same time that the challenge swings over into something unfairly punishing and frustrating, and it happens a bit too often in Aaru's Awakening. So, that's a boss. Now how do I... boss? Grandma, what big eyes you have. And more than two. Knowing how to boss doesn't not make bossing much easier. Everything here looks like it's really, really going to hurt.